Here at Pima Unified Schools, we are committed to delivering high quality, nutritious meals to our students. We recognize that the eating habits we form in our youth will stay with us for a lifetime. With this in mind, we strive to provide a healthful meal for your child in a clean and pleasant environment. Since good nutrition impacts classroom performance, our menus and food preparation is designed to assist student learning. 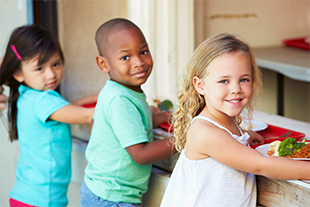 We also encourage parents to help their children eat healthy, nutritious foods both at school and at home. We also encourage parents to come to the cafeteria and enjoy lunch with their children. Please call the cafeteria ahead to reserve your tray. We are happy to provide breakfast and lunch every day for our students. We also participate in the Federal Free and Reduced Lunch Program for those who qualify. The Free & Reduced Application is available below to download and complete. Eligibility for this rate depends upon family income and number in household. Complete the form and return it to your child's school. To download or view the menus, you'll need a copy of Adobe Reader. Get your free copy on the Adobe Reader website.